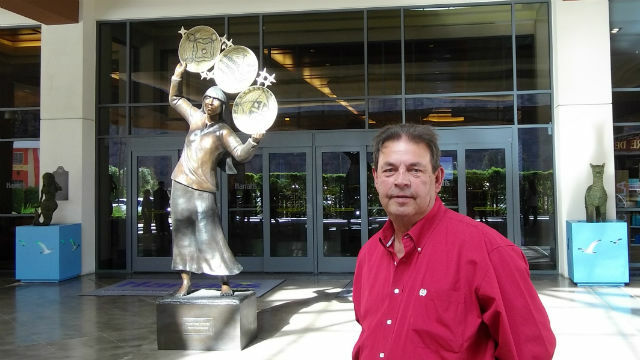 Harrah’s Resort Southern California unveiled on Thursday the lofty bronze statue of a Luiseño Indian woman as the latest piece in a program to bring fine art to the North County casino. “Milky Way Woman” by noted Native American artist Doug Hyde, who has sculpture at the National Museum of the American Indian in Washington, depicts a woman in tribal dress holding up baskets amid the stars. The 10-foot statue is situated at the valet entrance to the hotel and casino, so it will be the first thing most visitors see. “We have a very diverse customer base, and a lot of our customers like art,” said Darrell Pilant, vice president and general manager of the resort and casino. There are five other art installations in the casino north of Valley Center, but Pilant said “Milky Way Woman” is the first of four that will be symbolic of the Rincon Band of Luiseño Indians.